Why Does Coffee Hurt My Stomach? Coffee is a widely consumed beverage and common source of caffeine. For some individuals, drinking coffee causes stomach pain. Coffee contains a complex concoction of chemicals, several of which may be the culprits responsible for causing stomach pain and discomfort. 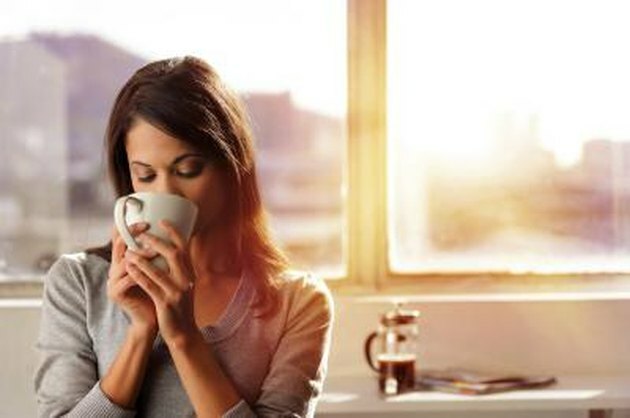 If you experience stomach pain after drinking coffee, you should consult your doctor, because in rare cases, stomach pain induced by coffee may be a sign of a health condition requiring medical care. Coffee contains large amounts of an acid called chlorogenic acid, according to an article published in the medical journal "Critical Reviews in Food Science and Nutrition" in 2006. In certain people, regular exposure to the chlorogenic acid in coffee, especially on an empty stomach, can lead to irritation of the stomach lining, also known as gastritis, the University of Maryland Medical Center reports. Gastritis often results in stomach or abdominal pain. Additional symptoms of gastritis include heartburn, hiccups, nausea and vomiting. Left untreated, severe gastritis can lead to the formation of a hole in the stomach lining, which is also known as a peptic ulcer. After an ulcer has formed, the acidic liquids and foods can cause even greater pain than gastritis alone, an article in the June 1992 issue of the medical journal "Gut" reports. Ulcers cause many of the same symptoms as gastritis and may cause more-severe symptoms such as vomiting blood or a dark substance resembling coffee grounds, as well as blood in the stools. Without medical treatment, peptic ulcers usually continue to worsen, causing additional pain and discomfort. The caffeine in coffee can also contribute to stomach pain through several different means. Caffeine stimulates the central nervous system, which can cause the stomach to produce excess stomach acid. This excess stomach acid can contribute to gastritis or ulcer formation. Caffeine can also cause cramping of the abdominal muscles, which may result in additional pain or discomfort. If you frequently experience stomach pain after drinking coffee, it may be a sign that you have gastritis or a peptic ulcer. Avoiding acidic beverages, including coffee, fruit juice and carbonated beverages, can help reduce gastritis. In addition, you should avoid alcohol, tobacco and nonsteroidal anti-inflammatory medications like aspirin and ibuprofen, which also irritate the stomach. If you have a peptic ulcer, your doctor may prescribe a medication known as a proton pump inhibitor, such as omeprazole. Can Drinking Coffee Cause Diarrhea? Can Spicy Foods or Caffeine Cause Gastritis? Does Caffeine Cause Stomach Pain?